Despite the fact that this past weekend was Father's Day and that Brett had to work all day Saturday and then shoot a commercial all day Sunday, I managed to get quite a bit of sewing and knitting in. Ok, I wouldn't really call it knitting since I was knitting up swatch after swatch trying to get gauge, but still...I was knitting up a storm! The yarn I'm using is a very thin, DK weight yarn. So it takes forever to knit up a little swatch that's 25 stitches by 25 rows! I'm a lover of chunky yarns, the chunkier the better. But this time I thought I would expand my horizons and try a different weight. I don't want to say what the new knitting project is, just in case it doesn't pan out. But I'm hoping that's not the case! I think this new pattern is just too cute for words and kinda have high hopes for it. So I'm crossing my fingers that it'll work out! As for the sewing, I had a bunch of projects already cut out weeks ago, in hopes to be able to sew a seam here and there whenever the munchkin was down for his nap. As of late though, naptime seems to not exist around here! So as soon as the wee one is asleep for the night, I sneak into my sewing closet and sew like a madwoman! I've decided that I don't care about the so-called noise/vibrations from my sewing machine and I'm going to sew 'til midnight the latest. I used to not use my machine after 10pm, after the neighbour downstairs complained that we were being too loud. But after she fired off round after round of complaints over the stupidest thing (like how we were supposedly "partying" with a lot of stomping around, when really it was the munchkin sitting in his high chair banging on his tray eating Cheerios...at 6pm! ), and complaining about things that we have no control over (like the fact that we "chop food too loud"), I decided she's a bitter old woman who tries to pull rank over us because she's been living in the building for over 10 years. I personally think that if you choose to live in a basement/bottom floor suite, and have been there for the past 10 years, then you should know how to live with the everyday noises that comes with it. This is me putting my foot down! Anyways, so I got a lot of sewing done. Which to me, is pure bliss. And I feel so accomplished when I can (finally!) tick items off my to-do list! 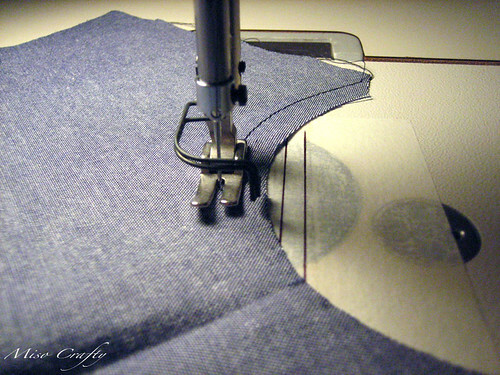 Sitting in front of my sewing machine and actually sewing made me realized just how much I truly miss sewing! School had completely drained me of all passion for fashion, and for sewing in general, that I'm starting to think that it's all (slowly) coming back! While taking the munchkin out for a cruise earlier today, I had a sensation that all I wanted to do was run home and sew and knit...even though it turned out to be quite a beautiful day! As soon as I take photos of my finished projects and get some of them uploaded on my flickr, I'll post them. But for now, my knitting is calling...and so is my bed...hmmm...which one to go for?